Can be used as a coffee table, bench or footstool. 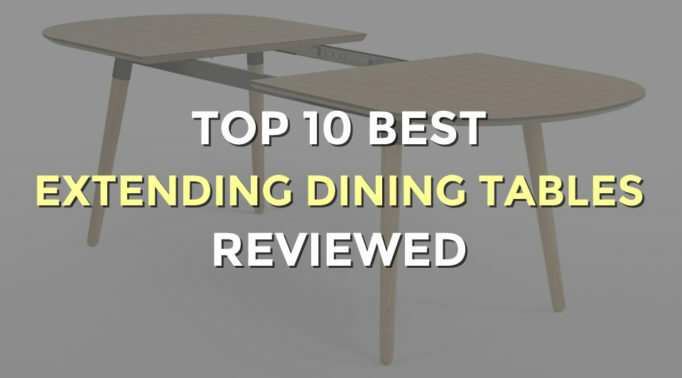 A piece of furniture that offers a seat, table and sometimes even storage space is undeniably useful around the home. 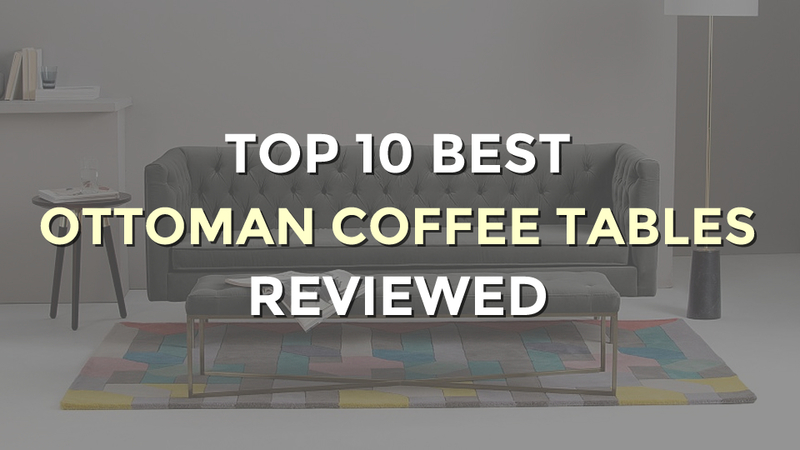 Our best ottoman coffee tables provide those qualities, and they’re also incredibly stylish while harmonising with your sofa and armchair. 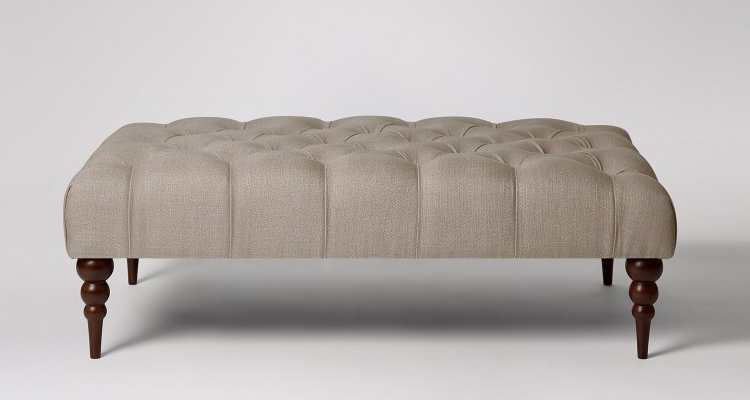 A plushly upholstered and highly capacious ottoman, the Chesterfield from Simply Chaise features a buttoned, thickly stuffed lid which, when opened, reveals a large storage area. The lid’s comfortable upholstery means that it would work as a low seat as well as a footstool and coffee table. Finished in a hard-wearing light blue fabric, its old-school charms speak of traditional craftsmanship and hand-finishing. The polished wooden legs are finished with brass castors, which only adds to the stool’s classic appeal. Refinement is the watchword of this tastefully designed, restrained looking ottoman coffee table and footstool from Marks and Spencer, which speaks of the discreet good taste associated with M&S. Available in an extremely wide range of colours and fabrics, this storage ottoman is shallow but wide, making it ideal for storing items such as newspapers or magazines. 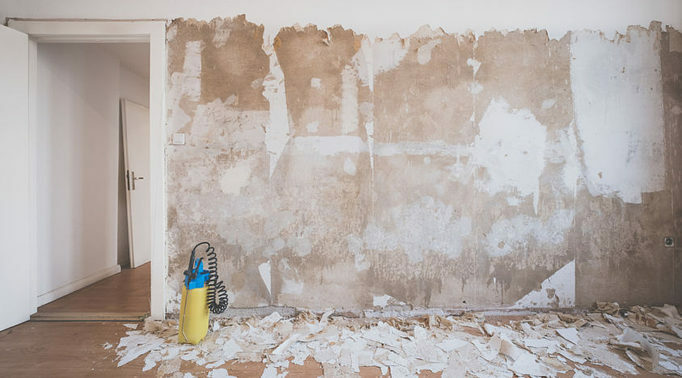 As well as helping to keep the living room tidy, its good looks and clean design help to make it a serene living space, and the high degree of flexibility over the finish means that there’s a Salisbury to suit any colour scheme. Very much a statement piece of furniture, the Julianne Ottoman from Made is a plus-sized, sofa-length ottoman, which is ideal for larger living spaces. 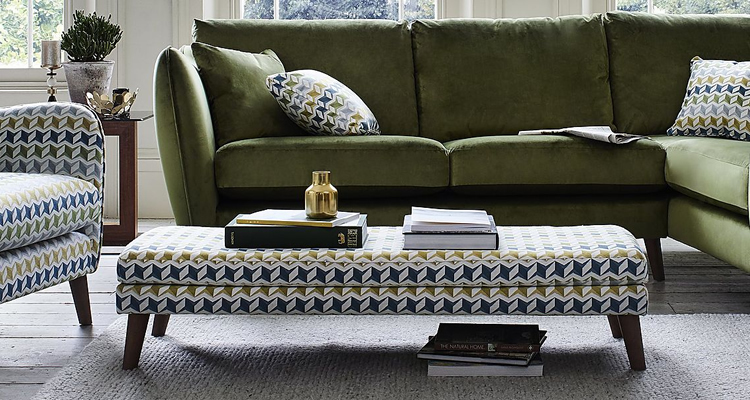 Thickly upholstered with foam and feather, it’s available in three tasteful colours. The traditional buttoned finish is offset by a sleekly modern brass frame for legs (which require fitting at home), a marriage of retro and contemporary styling which means it would sit well in most design schemes. This is a bold and comfortable ottoman, which would work as well as a low seat as it would as a coffee table and footstool. A great looking ottoman footstool/coffee table from the City Loft collection, this low-slung stool has lovely contemporary clean lines and an unfussy design which would see it work well in modern spaces; but it’s fabric finishes can give it that touch of home comfort and enough of a traditional feel to suit less modern schemes. Aside from the unfussy design, a big plus is the wide range of finishes available, from plain colours to intricate accent patterns, there’s something here to cater to every taste, and complement any design scheme. 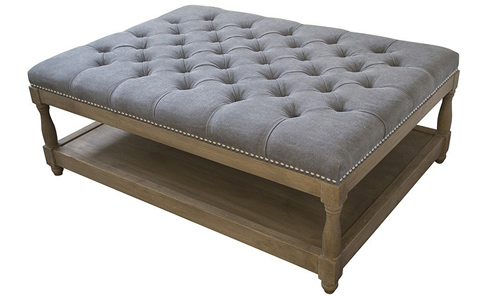 The Swoon editions Plymouth ottoman is a classic ottoman in the Chesterfield style, with its comfortable buttoned surface offering ample opportunities for footrests. Blessed with deep, plush upholstery, it is available in an extensive range of both fabrics and colours; its flexibility makes it a match for any interior design scheme, there’s even a choice of woods for the feet. 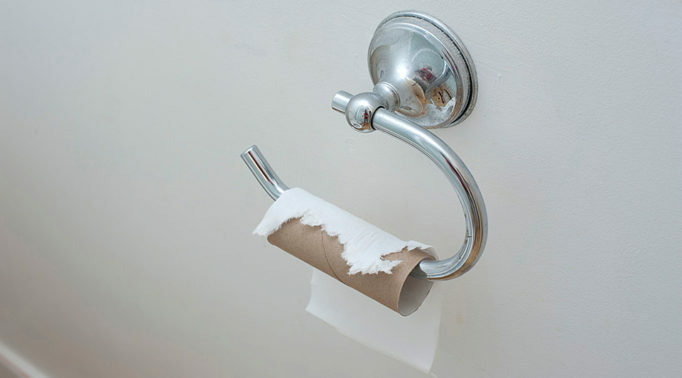 The fabric covering can be velvet, for a luxurious feel, or a soft and comforting woollen finish. Either way, this is the perfect way to put your feet up or to support a tray of tea and treats. 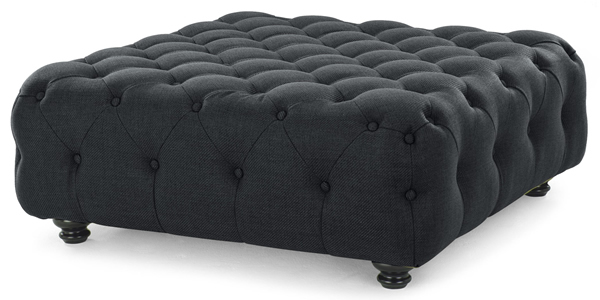 A hand-crafted, luxurious large ottoman, the Wallace from Oka offers a taste of luxury. Its top is an unabashed, uncompromising deep hazelnut leather, which is set in a brass frame. 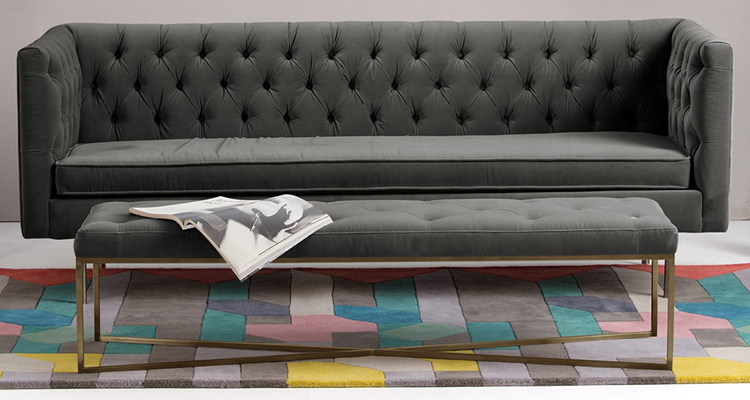 …but its size and presence means it would work best as the centrepiece of a room; a coffee table with a difference. As its top is natural leather, it will age gracefully, changing and improving as the years go by. 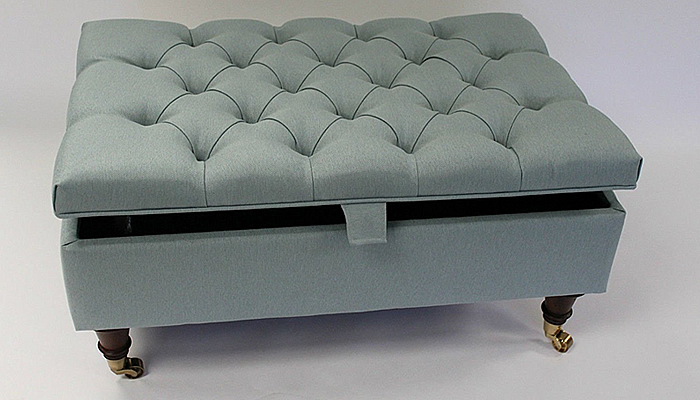 The Petit Royale Ottoman by La Residence is characterised by a classic design married to an air of opulence. With an upholstered, buttoned top, it gives off a discreet air of comfort, but the restrained tones of its colours; the upholstery being a natural linen or a muted grey and the legs being a pale, weathered oak, give it a tasteful appearance. This isn’t an ottoman which shouts about its presence, and it’s all the more beautiful for that. The storage shelf underneath is ample for keeping a good sized room tidy, and it’s large enough to do triple duty as footstool, low seat and coffee table: a class act. 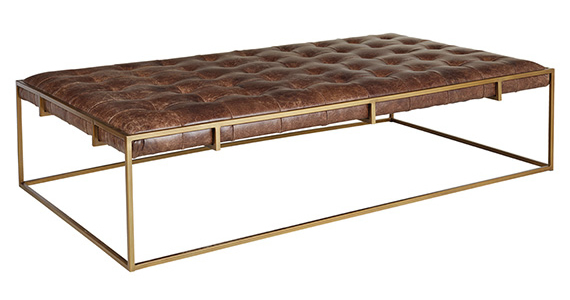 A four-square, chunky beast of an ottoman, the Branagh from Made isn’t here to play. This is a seriously thick, well upholstered footstool that doubles as a coffee table, with the buttoned padding extending down the sides. Some home assembly is required, but this is only the attachment of the black lacquered legs, a simple job. With the fabric a tasteful shade of anthracite, this ottoman is at once classic and contemporary, its chesterfield style design giving it a timeless feel, but the colour rooting it firmly in the here and now. In terms of storage space, this offering from M&S has a strong claim to be the best storage ottoman coffee table reviewed here. Styled as a chest, it has enough capacity to keep any living space clutter-free, but it remains an elegant and refined piece of furniture which would grace any living space as its chic focal point. 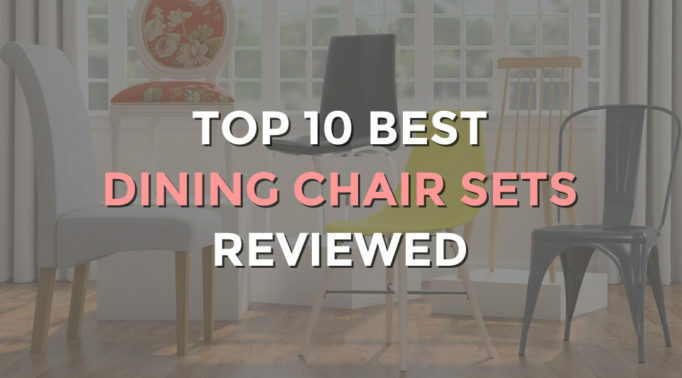 Available in a range of shades, patterns and leather or fabric finishes, the cleanness of its design means it could tolerate a fussy finish without looking over the top, or pick a more restrained shade for an harmonious design scheme. 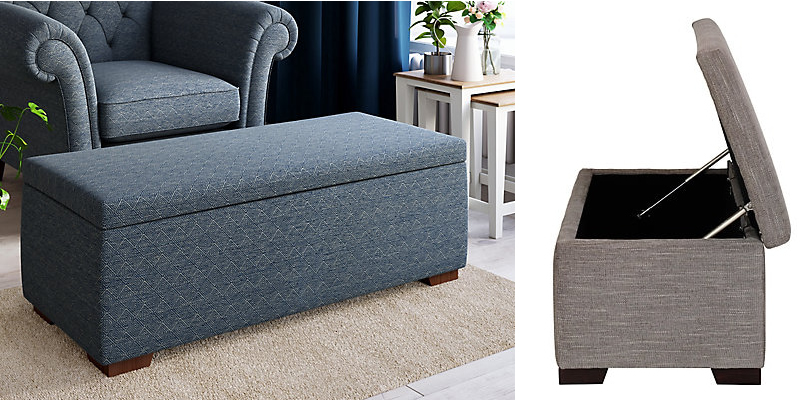 Another ottoman with storage at its heart, the Rosa from Sofa Heaven is an unobtrusive storage ottoman which would work equally well as a low table in a hallway or bedroom. With a choice of two tasteful colours, the hand made Rosa consists of an upholstered top, with storage within, on neatly turned low wooden legs. A classic design, which would be suitable for traditional living spaces, its contemporary colours help to bring it up to date, making this ottoman a versatile performer for a variety of spaces.